In Divining a Digital Future (2011), computer scientist Paul Dourish (Professor of Informatics at the University of California, Irvine) and cultural anthropologist Genevieve Bell (Intel Interaction and Experience Research Lab) again team up in an attempt to marry ethnography with ubiquitous computing (ubicomp) research. The book heavily builds on some of their previous collaborative work. Dourish & Bell propose to develop “a ‘ubiquitous computing of the present’ that takes the messiness of everyday life as a central theme” (4). Their scope embraces the far ends of mythology, the cultural ideal-narratives that shape ubicomp’s research agenda, and messiness, the complex and contested realities of how people actually use and interpret everyday technologies. The book is divided in three sections. In the first section D&B sketch the outlines of existing ubicomp research, and propose to cross-fertilize this research with ethnographical theory and methodology. In the second section they explore the potential contribution of ethnographical theory and methodology in four domains: infrastructures, mobility, privacy, and domesticity. The concluding chapter weaves together the various threads spun in the earlier chapters into a proposed framework for future research. After a short introduction, D&B revisit Weiser’s influential writings on ubicomp, present an overview of spin-off research in US and UK research labs, and discuss some critiques and amendments. All this with the aim to investigate “how new futures get to be imagined and incorporated into a research agenda such as ubicomp” (21). Weiser had portrayed ubicomp as a paradigm shift in computing, a third phase after the mainframe and desktop. Yet his vision remained firmly tied to traditional notions of the workplace. It pictured existing US middle-class computer users. And it raised normal paradigmatic design and engineering challenges. They show how Weiser sought to extend computer research to a broader field that should not only included technological research and design but also the humanities and social sciences. D&B reinterpret his well-known assertion of “getting computing out of the way” as not intended to make computing physically invisible but to have it play a role in agendas originating elsewhere (19). Curiously, in my view D&B do not pursue this thought to its logical consequence, that is, explore how ubicomp can also inform ethnographical research. Instead they do only the opposite: how can ethnography inform ubicomp? This is despite their own clearly stated intentions: “[t]he question at stake here underlies any interdisciplinary effort: the difficulty of achieving a true synthesis or mutually constituted discursive arena, rather than degenerating to a case in which one discipline is essentially in service to the other” (71). I return to this ‘one-way street’ point below. D&B distill three framing points that recur throughout the book. First, an emphasis on the ‘proximate future’ keeps placing achievements out of reach while ignoring that this future is already here, albeit in a different shape. D&B reiterate the point made in earlier publications that the ubicomp vision fairly accurately describes present-day mobile media technologies. “Arguably […] our contemporary world – in which mobile computation and telephony are not just central aspects of Western commercial endeavors but also facets of everyday life in a range of different countries and cultures – is already one of ubicomp, albeit in unexpected forms” (25) . Second, combined with a narrow focus on engineering challenges this absolves ubicomp researchers from looking at complex and varying socio-cultural settings and practices. Third, the envisioned singularity of its seamless future ignores the messiness of everyday life. Frequently, “cultural and social practices privilege disconnection, seams, and discrete distinct realms of activity and action” (22). Following an intermediary chapter with a layman introduction to anthropology, ethnography and cultural studies the book really takes off. In chapter 4, D&B note that ubicomp research tends to treat ethnography as a kind of delivery service for vivid empirical case material. This material then is used to suggest ‘implications for design’ (65). Adopting the empirical method of participatory observation just to find out “what users want” (64), means that other powerful contributions of ethnography get lost. First, the instrumental use of ethnography marginalizes the ethnographer’s own role in interpreting, revealing and explicating. By ignoring how relationships between ethnographer, subjects and settings are shaped by subject positions and power relations, it fails to concern itself with a deep understanding of ‘context’ (which after all is what ubicomp is about). Second, the ‘implications for design’ model positions designers as gate-keepers in shaping new technologies, thereby effectively placing ethnography and the people under study outside the design process. Third, and I think most important for the issues we are raising with The Mobile City, it assumes that people merely adopt and appropriate newly designed technologies into their everyday lives, instead of understanding technologies as sites for everyday social and cultural production and meaning (73). Ethnography teaches that culture is not a stable set of values and properties of people. It is generated through everyday practice, and at the same time produces everyday experiences (53/54). The conceptual distinction between a domain of everyday practice and a domain of technological design – the ‘social-technical gap’ (Ackerman, pdf) – therefore does not stand up. They are mutually constitutive. The gap then needs no closing, it is “where all the interesting stuff happens” (73). Such is precisely the problem with the line of reasoning we find in most accounts of ‘smart cities’ or ‘intelligent cities’. By merely seeking to employ technologies as plugins or add-ons to solve the problems cities face (more efficient energy and transport use, less wasteful water and food supplies, and so on), they fail to see how urban space and city life itself is constructed and understood through the range of technologies that urbanites use on an everyday basis. Technology and the city are not exclusive domains. Urban life is a technologically mediated life; and technological practices are intimately tied to urban situations and experiences. This engagement has implications for issues like responsibility and representation, and the distinction between designers and users. Being a cultural anthropologist by training myself, I found this fourth chapter the most stimulating and original part of the book. Read that one if you have little time. In the second section D&B put on this cultural lens. Building on ethnographical material, they show how infrastructures, mobility, privacy and the domestic realm are indeed far messier than the ideal of homogeneous and orderly spheres that can be catered by seamless, calm technologies. By infrastructures D&B mean not just the technologies that underlie various networks. Instead they outline a socio-cultural understanding of space and spatiality. As computing leaves the desktop and moves into spaces beyond, ubicomp researchers need to consider that these spaces are already inhabited. Through people’s practices space is produced and experienced as a series of infrastructures: of naming conventions, movements, types of social interactions, and so on (108). Pervasive computing must take into account the physicality of wireless infrastructures, the situatedness of mobile services, and the cultural framing of space. Moreover, technical infrastructures fail. This messy reality means that designers should focus on the fact that people give social and cultural interpretations to technological infrastructures, that architecture is all about boundaries and transitions (Chalmer’s ‘seams’, pdf), and that new technologies inherently cause people to reencounter space (115). All this is supported by ethnographic material, among others about Aboriginal central Australia (104-106). Early ubicomp research mainly focussed on the mobility of office workers in workplace settings. Nowadays, with publicly available wireless networks, the city itself becomes a major concern for the emerging field of ‘urban informatics’ (120). I am not sure whether a depiction of urban computing as the pureblood offspring of ubicomp is accurate. It doesn’t matter. More interesting is the question how ubicomp can continue to inform this quick-paced field to avoid being sidelined as the eternal promise. D&B propose to look at how “we start to encounter the spatiality of the city through the range of services that might be available there, especially when such services are deployed selectively”, and how “we think about personal mobility and urban movement in the context of technology design” (122). They call attention to mobility as a social practice, to the moral connotations of the landscape, to spatial imaginaries, and mobility in history. D&B unconvincingly suggest to trade in ‘mobility’ for ‘fluidity’, on the ground that mobility presupposes fixed boundaries and relations between discrete places, objects and activities among which we move. Fluidity, by contrast, emphasizes adaptation to continuous variability (134). I don’t believe that many involved in mobility studies will follow suit. A ‘new mobilities paradigm’ has been called into life precisely to counter stable sociological notions, while not losing sight of the fact that fixating boundaries and protocols (not necessarily ‘fixed’, they may be unstable and temporary) are continuously produced, maintained and indeed needed . Fluidity conjures up all sorts of post-modern sweeping generalizations of a supposed boundary-less world, the ‘melting of solids’, nomadic subjectivities and the fragmentation of identities, etc. That seems a step back to me, especially when one is interested in an ‘on the ground’ view of the messiness of ubicomp or urban computing practices. After a chapter about privacy, D&B turn their attention to the domestic sphere as a new arena where information systems are deployed. This complements Weiser’s prime emphasis on the office. The home is not a spatial category but a social category imbued with emotional and moral values. They present a lengthy analysis of the shed as the edge/margin/fringe/periphery of the domestic, to scrutinize technological conceptions of the ‘smart home’. Their shed analysis resuscitates classical anthropological notions like Arnold Van Gennep and Victor Turner’s ‘liminal space’ (173), Erving Goffman’s ‘spoiled identities’ (174), Lévi-Strauss’ ‘bricoleur’ (174), Van Gennep’s ‘rite the passage’ (175), Mary Douglas’ ‘purity and danger’ (175-180), and Malinowski’s ‘gift circles’ (181). As one term tumbles over the next, I couldn’t help but wonder whether this is all a bit too much for the novice ubicomp researcher of good will. More troublesome still in my view is that they ignore how ubicomp research can be good sport and give something back to anthropology, perhaps by refining old concepts with current insights. This could have been a fine opportunity to indeed achieve “a true synthesis or mutually constituted discursive arena” (71). How? For example, ‘liminality’ (limen = border in Latin) seems to no longer describe clearly spatio-temporally confined zones where everyday norms are suspended or inverted, as in the ‘primitive societies’ that Van Gennep wrote about . Technologically mediated interactions – e.g. mobile communication as a ritual type of gift exchange  – are more tightly woven into everyday interactions. Debates in the ubicomp field about ‘seamlessness’ vs. ‘seamfulness’ then could inform a deepened anthropological/sociological understanding of notions like ‘copresence’, and help to re-conceptualize the term ‘liminality’. In this ‘interdisciplinary hybrid practice’, cultural phenomena are prior, not consequent, to design (189-191). It involves asking not what things people might want to use, but asking what people do and feel and how technologies then can play in a role in this (192). This means a shift in emphasis from things to people (not unlike Nold & Kranenburg’s recent plea for an “internet of people” rather than an ‘internet of things’, or my argument in this post). D&B propose three orientations for future ubicomp inquiries, aiming to add complexity rather than wishing it away. These are: legibility (how people read places, technologies and actions), literacy (how information is represented), and legitimacy (attention for culturally variable forms of ‘environmental epistemologies’) (D&B, 2011: 192-200). These strike me as precisely the themes that locative media projects frequently seek to address. Nevertheless D&B do not pay attention to the locative media field, which seems an odd omission in this light. Digital technologies can render the everyday world collectively legible in two ways, D&B say. Panoptic legibility involves centralist modern planning. It is a view from above that seeks to eliminate differences in favor of a coherent ordering. Local legibility looks at the heterogeneity of objects and actions. It reflects how people in practice engage with the world and emphasizes individual differences. Not surprisingly, D&B talk about “making the invisible visible” in location-based systems, social networking and data-mining (195). In their view sensing technologies order the world rather than describe it (195). With literacy D&B draw attention to the ways ubicomp represents objects and activities in everyday life. Again unsurprisingly, they turn to cartography and mapping. Here too they distinguish between top-down and bottom-up practices. In contrast to the standardizing Mercator projection, ‘occasion maps’ or ‘mud maps’ consist of just the information needed for that situation. When people draw out directions to someone they narrate a journey instead of representing space as a homogeneous Cartesian container (197). Cultural knowledge is performative rather than representational. Nonetheless D&B raise valuable points here, with some interesting (more philosophical) implications also for urban culture. For instance, from an organizational standpoint the recent surge in open gov/open data and citizen science projects appears to break with singular institutional proprietorship of information. Yet from a critical viewpoint, its underlying episteme continues to be a ‘management by the numbers’ and calculative rationality. The supposed democratic appeal of open data then merely serves to discursively legitimize the quantification of almost any aspect of urban life. More concretely, the question arises whether the good city is one where every possible variable is set, measured, visualized, and therefore can be acted upon. Examples abound. Is the air clean enough to go out? Check! Is the traffic not too dense? Check! Is the house party across the street not producing more noise than allowed by policy? Check! Is the crime rate in the new neighborhood low enough (for my insurance)? Check! Have I burned my 2500 calories today? Check! So what’s wrong with this ‘quantified city’? Isn’t all this great!?! Sure, but it also raises new concerns. For instance about representation, both as in who represents and as in what is represented. Who sets the norms? Who does the measuring? Who have access to those technologies, data sources and enough skills to do something useful with it? What is actually represented, what is being left out? What problem is being fixed and for whom? Steven Johnson for example asks in Wired whether these data and apps can do more than solve clearly definable problems. “The question is whether these platforms can also address the more subtle problems of big-city neighborhoods – the sins of omission, the holes in the urban fabric where some crucial thread is missing” . In other words, how to measure and visualize things that are not there or solve problems for those who don’t speak? And what about urban issues that are too complex or impossible to quantify? Courtney E. Martin asks in Next American City magazine: “how do these tools handle complex urban challenges like gentrification, teenagers with nothing to do, or mental health issues affecting the growing homeless population? It’s noble to empower citizens to ‘see, click, fix’ when they spot broken potholes, but there are larger, more intractable looming problems that require far more nuanced and complex systems of engagement” . In other words, will a break with institutional proprietorship result in a broadly felt ownership of the city? An ethical question to finish: to what extent will these systems nudge or force us into homogenizing regimes of quantified normalcy? (“You’ve reached the average/maximum/minimum .., do you wish to continue?”) And what does that mean for urban public life as an ongoing negotiation of conflicting values and differences? Too bad D&B only look at ubicomp in relation to mobility and the domestic sphere and do not pay attention to publicness. Dealing with differences in public space seems to me one of the more interesting concerns for situated computing. In Divining a Digital Future D&B reiterate many arguments made in earlier work, provide them with more flesh, and formulate some future directions for ubicomp. To be sure this is not a bad thing, neither for those who wish to read a book on the current state of affairs in ubicomp, nor for ubicomp researchers who wish to enlarge the scope of their own practice. The book attempts to foster an anthropological sensitivity among its (presumed) CHI readership. Fundamentally, their proposition to approach technology (and urbanism) through an ethnographic lens is highly relevant in my view. Imagine what the future of our cities look would like if it were the sole concern of coders and engineers? Indeed, we should never forget Jane Jacobs’ lesson that livable and lively cities are about people. I also appreciate their relational view of ubicomp as intricately bound up with the messiness of everyday life, their concern with its multiplicity of forms and shapes, and their attention for fringes (edges, periphery, margins). Important too in my view is that D&B implicitly question the notion of ‘the everyday’. The everyday does not consist of stable pre-given categories (home, mobility, etc.) that can be supplemented with ubicomp. It arises from socio-cultural performances and is continuously negotiated. Still, they could have stated this even more explicitly, because ‘the everyday’ is so often unproblematically assumed as a self-explanatory term in both technology and urban studies . Surely these are familiar insights to (urban) sociologists and anthropologists. There is nothing particularly ubicomp about them. If ubicomp’s added strength indeed is bringing in the design part (see the previous quote, 187), I would have been curious to learn about an actual case of successful ethnography+design synthesis where both sides are mutually constitutive. Moreover, there is a certain circularity in the argument: we encounter space through cultural logics; these logics are created by our movements through space. Here’s another typical example: “Legibility is a product of a social and cultural encounter with the world; in turn, it structures and shapes those encounters” (195-195) . D&B’s closest answer to this question of ‘mutual shaping’ (134) is to say: “[t]echnologies provide us with ways to narrate space, to describe and articulate it, but narratives have a way of becoming self-fulfilling prophecies as accounts of everyday life become sedimented as understandings, expectations, and predictions” (135). Here’s where their frequent metaphorical use of the (cultural) lens comes in (e.g. 53, 58, 78, 94, 106, 120, 123, 134, 135). D&B continually point out how ‘cultural lenses’ mediate people’s experiences of space and place, and their use of technologies. Metaphors however conceal as much as they intend to reveal, so the cultural lens is problematic for at least two reasons. First, it does not give an account of how culture itself is internally divided and subject to change. The lens is a rather static metaphor. Second, it implies that people can only wear one lens at the same time. It does not take into account that an increasing number of people move between various cultural settings, or are brought up in multiple cultural contexts, and therefore are accustomed to multiple – often conflicting – lenses. Questions like these should be posed as well in order to forward the work on computation that is truly contextual. Dourish, P., & Bell, G. (2011). 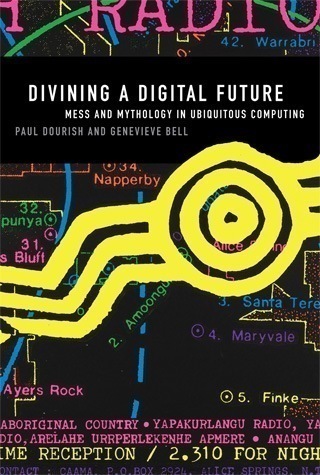 Divining a digital future: mess and mythology in ubiquitous computing. Cambridge, Mass. : MIT Press. Moran, T. P., & Dourish, P. (2001). Introduction to This Special Issue on Context-Aware Computing. Human-Computer Interaction, 16(2-4), 87-95 (p. 87); Bell, G., & Dourish, P. (2006). Yesterday’s Tomorrows: Notes on Ubiquitous Computing’s Dominant Vision. Personal and Ubiquitous Computing, 11(2), 133-143 (p. 135). Van Gennep, A. (1960). The rites of passage. London: Routledge & Paul (originally published in 1908) (p. 115). Courtney E. Martin (2011). Hope? There’s No App for That. In: Next American City magazine, Summer 2011 issue. See for instance: Ehrmann, J., Lewis, C., & Lewis, P. (1968). Homo Ludens Revisited. Yale French Studies (41), 31-57. Ehrman criticizes the unquestioned assumption of an a priori realm of the everyday, the ordinary, reality, as somehow separate from play. The structure vs. agency problem is a well-known chicken and egg question in the social sciences to which a number of solutions have been advanced, like Giddens’ praxis, Bourdieu’s habitus, or Latour’s escape from it altogether with actor-network theory.